I just love Cambridge Market – even on a chilly November day, it’s full of wonderful stalls selling practically everything. Yesterday, we ( three of us) I decided to treat ourselves to a day in Cambridge. 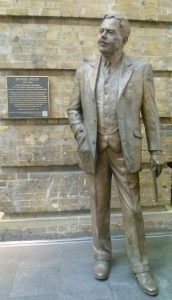 We met at 10 am at the statue of Sir Nigel Gresley (famous steam locomotive engineer) by the ticket office at King’s Cross station. I was waiting by the statue, when a man came up and gently patted Sir Nigel’s arm before bending down to explain something to the small boy with him, and gesturing towards Sir Nigel. Obviously a train buff. I understood how he felt. I love steam engines myself and, as a child, I used to wave at Sir Nigel’s elegant trains as they flew past, smoke streaming from their funnels. I usually got a ‘toot’ from the engine driver. For me, seeing the statue of Sir Nigel Gresley brings back childhood memories of going somewhere exciting on a train. My friends arrived and we headed off for platform 9: the fast train to Cambridge took only 45 minutes. On arrival, we headed straight for the Fitzwilliam Museum, first for an essential cup of coffee and then to see the Dégas: a Passion for Perfection exhibition – terrific – before heading to Market Square for lunch and a look round the market. There are take-away food stalls a-plenty: Vietnamese, Indian, burgers, you name it, they are there. But we needed to sit down (culture can be tough on the feet), so we found an Italian restaurant and had a pizza. We didn’t have long at the market, alas. Winter days are short; it would be getting dark in a couple of hours and we had to walk back to the station. So we had to visit our favourite stalls fast. A market has been here since the middle ages and it is open seven days a week, from 10am-4pm. I got out my camera. 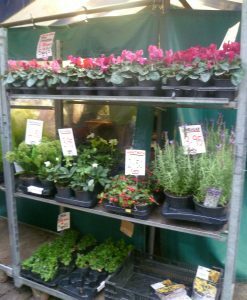 At one corner of the market there was a plant stall selling cheerful pink cyclamen and pots of lavender, with cut flowers in pails of water round the side. A Japanese couple were discussing which pot of rosemary to choose. Nearby was a scarf stall with a whole rack of colourful scarves. 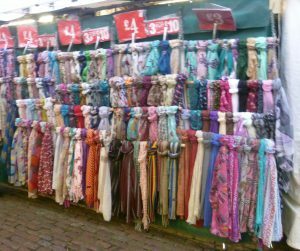 As you can see, none of them are very expensive; I’ve bought scarves myself here before and they are excellent value; I have gradually acquired four different coloured silk scarves (crimson, white, silver-grey and royal blue) from this stall. You can wash them in the washing-machine and all they need is a light iron. The only problem is one of choice. The Glenysself hand-made stall has been here a while, too. 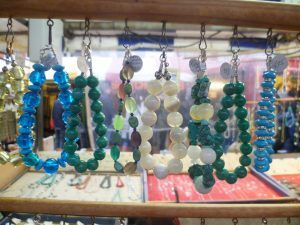 She specializes in silver, glass and semi-precious stone necklaces, earrings and bracelets and she sits at the back of the stall, small tweezers to hand, making her beautiful jewellery. You get something unique here for no two pieces will be exactly the same. But this is a market for ordinary food, too. 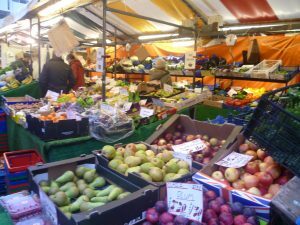 The fruit and veg stall I passed is large and occupies several stall spaces. I photographed it from the apple and pear end, but there is a large box of broccoli on the right, and salad vegetables on the shelves at the back. 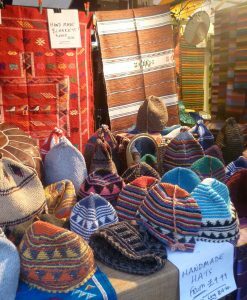 This is a stall I haven’t seen before, selling hand-made hats and blankets. (The last time I was in Cambridge was in May 2016, which may account for it). I love the vivid colours – just right to cheer you up on a cold winters’ day; and, as they are hand-made, you won’t meet anyone else wearing the same hat. Also new to me is the Pearls of Polish Craft stall. 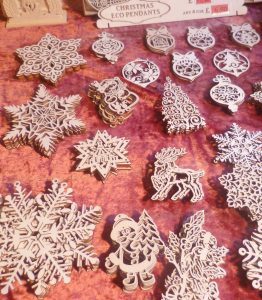 I really liked the unusual balsa wood Christmas tree decorations with stars, reindeer, Christmas trees and various Polish folk designs. They are in the natural wood but you could, I imagine, paint them different colours, or add a little glue and sprinkle them with glitter, if you wanted. 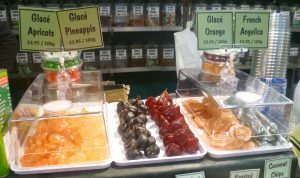 The Emerald Foods stall looked wonderfully Christmassy with the shiny glacé fruits: apricots, pineapple, orange and French angelica. Behind were shelves holding dozens of jars containing all sorts of nuts and spices. This is just the right place for a deliciously, finger-licking sticky Christmas treat. 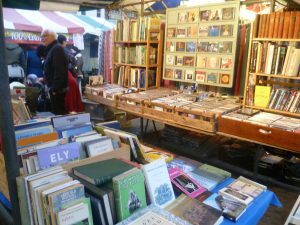 Last, but certainly not least, were Paul Neeve’s books, stretching over several stalls. We all zoomed in like homing pigeons. There are always eager customers here – this is Cambridge, after all, home of the world-famous university. And the books are special, too. There are hardbacks and out of print books here you would struggle to find anywhere else. OK, you might get your obscure Arnold Bennett novel on-line, but you couldn’t browse through it first. Paul’s stall is open Mondays, Wednesdays, Fridays, Saturdays and Sundays. It was time to go. The light was beginning to fade, a chill wind had got up and we had about half and hour’s walk back to the station. 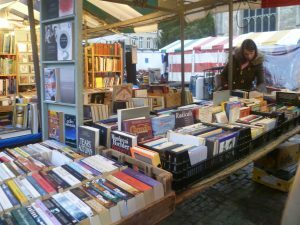 I am more than half inclined to go back to Cambridge before Christmas and have a longer wander round the market – this time with my Christmas present list to hand. Oh, those scarves! I am a scarf fanatic and have loads of them to throw about me. I would never have left that stall without one – or two or three! Love old bookstalls too. And what a lovely colourful place altogether. Terrific and worthwhile, I should think. Thank you for your enthusiastic reply, Elizabeth, which made me smile. Yes, the colour is definitely one of the things I loved about the market. It was impossible to walk around and not be cheered by the blaze of colour – not to mention the delicious aroma of all that food! I know Cambridge market very well indeed as I don’t live far away. All my early earrings and a vast proportion of my library came from there! Lucky you to live so near. I, too, have found it difficult to come away without either a book or some earrings – or both. The market in Cambridge behind Great St Mary’s is indeed worth visiting. These days I am only up in Cambridge for the odd event at my college so I am usually busy when I am there, but I always try to find time to pass by the market. The array of scarves is enticing. I have far too many already but my husband often encourages me to add a further one to the collection from the stall. Most recently it was grey with an Indian tree motif in black. The book stall is a joy and I rarely come away empty handed. The last acquisition was a survey of British art in the 20th century about which I have a rather spotty knowledge – so a systematic overview is worth having. Thank you for your comment, Pauline. I have to admit that the market is one of the main reasons I go to Cambridge – that and the Fitzwilliam Museum. Though I’m looking forward to Kettle’s Yard re-opening next February. Elizabeth, thank you for your warm words – in contrast to the chilly day – about your visit to the market in Cambridge. The Markets team that I manage on behalf of the City Council are delighted that you enjoyed your visit. As you note, there are many traders who do the market a great credit with their wonderful range, knowledge of their product, good humour and customer service. We are doing all we can to further promote the market and its traders by trying to see it acknowledged as Britain’s Favourite Market – a nationwide competition run by the national markets authority (NABMA). If you would like to support us please click on the following link https://www.nabma.com/vote/ and enter ‘Cambridge Markets’. Click ‘send’ and you have voted! Many thanks once again for your comments. I’m delighted to have been able to spread the word!